Are you tired of your mundane chat background on Viber? Do you find it kind of boring? Well, here’s good news. You can now have a nice and beautiful background image in your Viber chat. This article will guide you how to change chat background on Viber and choose from more than 70 pictures with fancy and cute designs. You don’t have to stick to the old and boring Viber chat background. You can change your chat background based on your mood. You can also have a different background for different contact. So go ahead, personalize Viber to your liking. 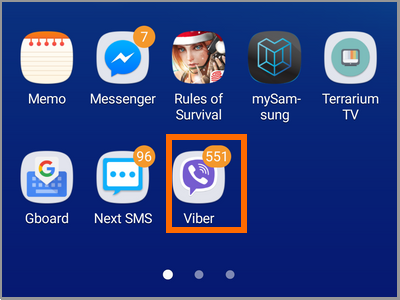 Check out this article to learn how to change chat background on Viber. 1. In your Home screen open your Viber app. 2. Go to your profile by tapping the More button. It’s three dots aligned vertically in the bottom right corner of your screen. 3. Look for the Settings tab. Tap it to go see its menu. 4. Inside your Settings found the different profile menu. Tap the Change Default Background. Take a look at the icon on its left side. It’s the preview of your current background image. 5. You will see the gallery of background photos to choose from. Tap the one that suits your eyes. 6. Your screen should display the preview of your chosen photo. Then tap the Choose button in the top right corner to continue. Otherwise, tap the arrow on the top left to choose a different one. 7. The preview icon on the left side should now be the background image you’ve just select. The new default background is applied to all your Viber conversation. If you want a different background for a certain chat, do the following. 1. Choose a chat that you want to have a separate background image. Tap the contact or group to open the chat. 2. Press the contact’s username placed in the uppermost part of your screen. 3. A drop-down menu will appear. Tap the Chat Info & Settings tab. 4. Go to the Chat Background tab. You will notice the preview icon is located on the right side instead of on the left. 5. The next window will display the options from where the background is coming from. You have the Background Gallery, Choose Existing, and Take Photo. Also, you can choose to Remove the Background as well. For this article, tap the Background Gallery to go to the pre-installed images. 6. Select the images you want to use for this chat. 7. Tap the Choose button. The selected background image should take effect immediately. You should see it in the preview icon as well. Refer to the images below. Q: I don’t like the images from the background gallery. I don’t think they fit with my conversations and messages. Do I have other choices? A: If you’re pertaining to giving a background image for one conversation, you have other option. Take another look at the fifth step above. Aside from Background Gallery, you can choose the Take Photo or the Choose Existing option. The Take Photo option will allow you to capture a picture and make it your background while the Choose Existing option will give you the chance to pick a photo from your camera roll. Q: Can I also put a personal photo took from my phone to be my default background? A: Unfortunately no. You can go that level of personalization if you’re going to a specific chat. Unless you do the manual process chat by chat, there is no way to use personal images as a default background. There you have it! Give your chat room a new and personalized look. With this, you will never get bored on the visual screen of your chats. Not only that, but you can also easily identify with whom you’re chatting to. You just learned how to change the chat background on Viber. If you have questions about any of the steps above, let us know in the comments section.